Today some one posted a magnificent poem on turban. But alas! the poet was not aware that ‘saffron’ is not a Sikh colour. Blue and yellow have been Sikh colours but the 10th Lord approved blue colour for Sikh worrier’s uniform and flag. Brahmin scriptures consider blue as the colour of Shudra the depressed ones. Similarly ‘iron ‘ has been considered the metal of shudra. Thus Guru wishes that his Sikhs identify themselves with the low i.e humility. 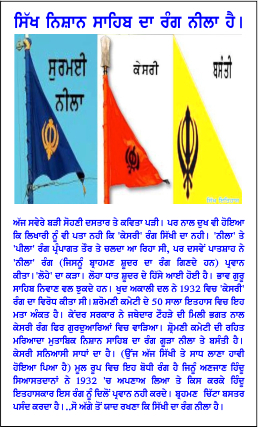 Friends will be surprised to read that in 1932 the Akal Dal passed a resolution opposing kesri the saffron colour. (see 50 year history of SGPC) See the irony: the Akali Dal has changed the colour of Sikh standards in Gurdwaras to saffron to please their Brahmin master. This was done by Govt in connivance of Jathedar Tohra. Even according to code conduct (Rehatmaryada) of SGPC the Nishan sahib has to be either dark blue or yellow. Saffron is the colour of Hindu hermits who believe in renunciation though originally it is Buddhist colour. The Hindu historians are yet to accept saffron and rue at the decision of ignorant Hindu politicians. Brahmins favourite colour is white. So please keep in mind for future the Sikh colour is ‘Blue’ (yes Neele wala) and basanti the yellow (saron the mustard flower). Sikh religion and concept of separate identity was brainchild of Cecil John Rhodes, under command of Rothschild banking empire from city of London, (2 square mile area in London a sovereign financial state in UK) to own/rule Indian trade. They wanted army after 1857 when Bengali fought with them. They form a new marshal race and even British officials become Sikh. Please read about the mohiyal brahmin of Punjab and their tradition of giving or dedicating their first child to GURUS as their SIKH. I am a south Indian brahmin and follow SIKHISM. sir, saffron is color of flame. flame of knowledge that can burn one's accumulated karmas. To burn the karmas, wearing a saffron robe is not a must. To burn the karmas, Lighting the flame of knowledge is a must. Saffron is equally important to Hindu, Budha and Sikhs as all three believe in burning of karmas for liberation. Incorrect article, with obvious intent of creating social divide. Saffron indicates sacrifice, sacrifice of our worldly desires, renunciation, and total submission to God, His will and His authority. It is considered a central symbol in Hinduism, Buddhism and Sikhism, since they all preach the same underlying spiritual principles.